These are some files and utilities that are useful when playing with TTDPatch, or sometimes even without it. You can use the up arrows to get back to the top of this page. Both of these programs allow you to edit the configuration file in a user-friendly, "just check the box" kind of way. Both have similar functionality, just pick the one that works better for you. Automatically supports all versions of TTDPatch from 2.0.1 alpha 25 and higher. Use it to quickly change all TTDPatch settings in ttdpatch.cfg. Click on the screenshot to download it. Please update to the latest version of the configurator. Click on the screenshot for more info. 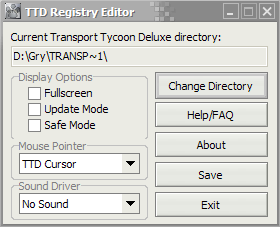 This tool allows you to conveniently edit the TTD (Windows version) registry settings. 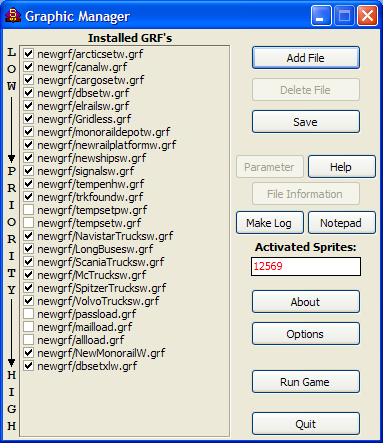 This program allows you to configure your newgrf(w).cfg to choose what new graphics files to load and in what order. Since version 1.9, TTDPatch supports translating the messages it displays in the game, for example the bribe messages. Normally, these are limited to the languages TTD itself is available in: English, French, German and Spanish. If you have a version translated with the TTD Translator, TTDPatch needs updated translations too. This is what "mkpttxt.exe" is for. Run it, and it will generate "ttdpttxt.txt" and "ttdpttxt.dat". Run "mkpttxt.exe" again to update "ttdpttxt.dat"
Note that the file "ttdpttxt.dat", which contains the data loaded by TTDPatch, is version specific. It will not work in future versions of TTDPatch, so don't delete the "ttdpttxt.txt" file you have, and you can just get the latest "mkpttxt.exe" file to update it for newer TTDPatch versions. Similar to mkpttxt above, this program allows you to translate all names in a new graphics set to your language. Download it: grftrans.zip (6 KB). Simply translate the lines in dbsetw.txt that don't start with "//" or "*"
Put dbsetw_trans.grf in your newgrf(w).cfg file, after the file it translates, e.g. TTD Alter is a useful tool that allows you to modify some of TTD's internal values. If you haven't yet upgraded to Owen Rudge's TTDAlter version 4, download it now! All you have to do to make it cooperate with TTDPatch, is to enable "Delete TTDLOAD[W].OVL when saving" in the options menu. Alternatively, you can tell TTDPatch to always rebuilt the OVL file by putting "forcerebuildovl on in the configuration file. This is a selection of some savegames that show how you can use TTDPatch to improve your TTD gameplay. Please unzip all of these into a separate directory to avoid overwriting your own savegames! This one is just a demonstration of how pre-signals really work. Be sure to try all the suggestions that you see in the game. One problem with TTDPatch is that the new non-stop handling breaks the title screen, in that there are lots of crashes between the monorail and the road vehicle. This savegame is a TTDPatch-optimized version of the title screen, which eliminates these crashes. It was contributed by Marcin Grzegorczyk. The feature of this savegame is a huge, optimized station. It is connected to a food processing plant (yes, it's in the arctic climate), and has a turnover of up to 3000 crates of food in a month. The station has 7 platforms, three of which are reserved for food trains, notice how this is accomplished with a checkpoint station. It also employs combo signals to allow the grain and livestock trains to enter all four tracks reserved for them, and yet allow two of them to enter the station simultaneously. It has also a large network, where everything is connected to everything else, and still trains don't get lost. It may look ugly in some places, but it works! 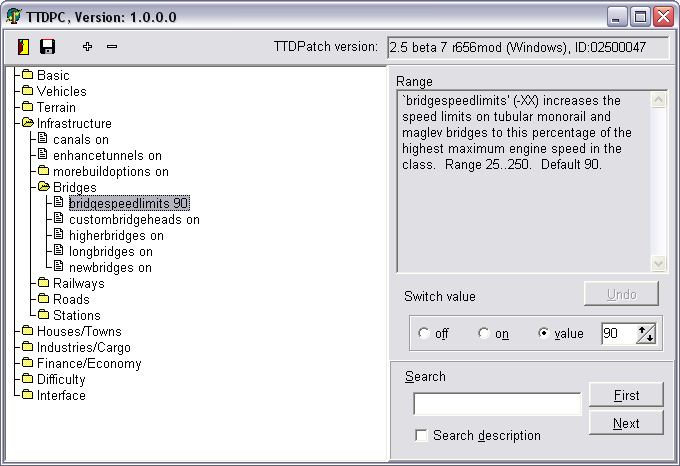 For best results, all of TTDPatch's options should be activated by running "ttdpatch -a". Also requires that SV1Codec is installed in the same directory. Sometimes, the game forgets the location of the headquarters of a player. If that happens, the game will crash if you move to the top corner of the map, or if you click on "View HQ" for that player. Sometimes it will also crash randomly if a vehicle gets close to that part of the map. This will be fixed by searching for the real location of the headquarters, and telling the game where the headquarters are. If a player (human or AI) removes a station that is currently part of a subsidy, TTD will crash when you open the subsidy menu, or sometimes at the start of the next month. This will be fixed by removing the offending subsidy from the list. In addition, version 0.04 is an update to sv1fix that makes it able to deal with savegames produced by TTDPatch version 1.9.1 alpha 32 or later, which contain extra savegame data that sv1fix didn't know about. A lot of problems in multiplayer games are caused by loss of synchronization, which means that the games aren't quite the same on both computers. For example, a train may not exist on one of the computer, and may confuse TTD so much that it crashes or locks it. This program can (probably) help with such synchronization problems, by re-synching the savegames. Basically, you take the savegame from one computer, transfer it to the other, flip the player numbers, and load the game. Then it should be synched perfectly, for a while at least. You'll have to repeat this procedure every once in a while, of course, but you should be able to continue playing in principle. Drag-and-drop the savegame onto sv2flip.exe. Load the game, and hope it works! I'd appreciate any comments you have about this utility.